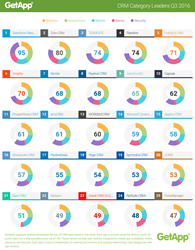 GetApp has released its Q3 2016 list of the top 25 cloud-based business applications for CRM. Salesforce Sales Cloud took the top spot with a score of 95, followed by Zoho CRM and TEAMGATE in second and third place, respectively. The Category Leader ranking is aimed at business owners looking for a CRM solution. The ranking provides an overview of the top CRM solutions and the rankings are based on five different criteria, with a possible max score of 100. The five data points, worth 20 points each, include user reviews, integrations, security, mobile app availability, and media presence. “Salesforce Sales Cloud was difficult to beat this quarter with perfect scores in integrations and security, as well as high scores in media presence, mobile, and reviews totaling a score of 95. Zoho CRM came in second with a score of 80 due to their high scores in reviews, integrations, and mobile availability for iOS and Android. TEAMGATE came in third with a score of 74 and received high marks in security and reviews. In fact, it was a strong showing from the top five, with Pipedrive coming in fourth place with a perfect score of 20 in reviews and HubSpot CRM coming in fifth with a perfect score of 20 in media presence,” says Suzie Blaszkiewicz, project manager of the Category Leader rankings. See the entire Q3 2016 ranking of the top 25 CRM solutions here.